Our highly detailed Bio Hazard wind-proof lighter offers excellent functionality without the high price. Features include an all steel body with aged finish and Apocalypse style artwork. Not Zippo brand. Mine closes fine but I have to refill it every 2 days. Overall it isnt a bad lighter, and its small enough to fit in that little cell phone pocket on my jeans. I originally bought this lighter because I thought that it was a great deal and wouldn't add much shipping to the rest of my order. But I made a big mistake, the lighter was made with a flimsy hinge that easily bent, it always took three of four tries to get a flame, the wick was too short, lighter fluid constantly leaked, the lighter heated up very quickly and was very slow to cool, the flint sprayed thick dust when the wheel was turned, and just over a month after receiving it the wheel completely destroyed the flint turning it into fine dust and two or three large flying pieces. 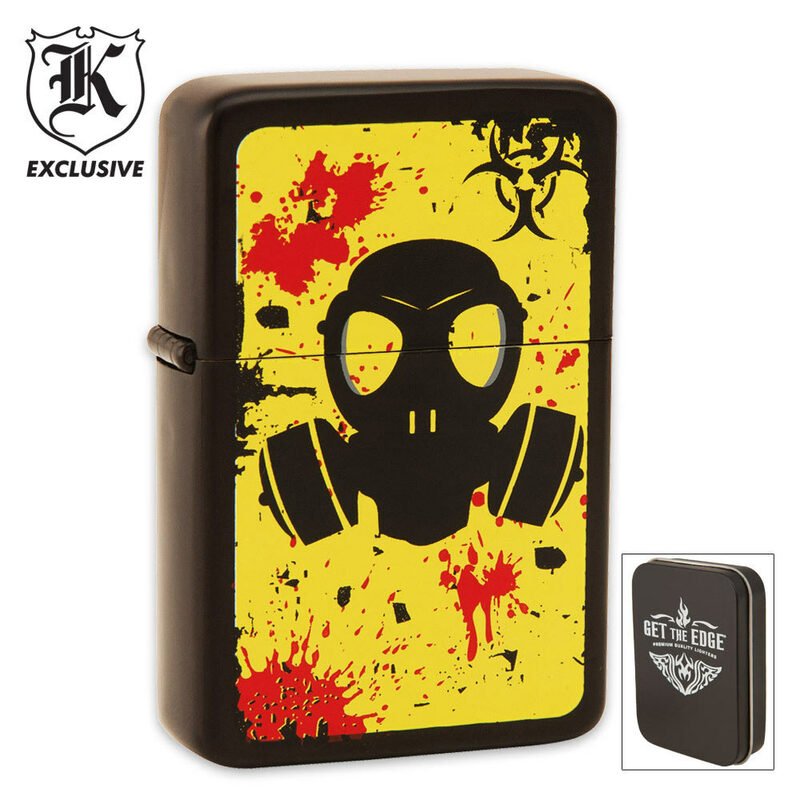 You're much better off buying a higher priced Zippo that you can rely on. Bit smaller than a zippo but also a LOT cheaper.. need to keep pushing actual lighter into case to get it to close properly though. A very good lighter. Not very big and lid does not shut good, but still very good. Pretty good not wind proof, but good flame and a bit smaller than a Zippo otherwise a good lighter.